Book Pharaoh Islands Taba Snorkeling Tour. Taba Island Yacht Excursion to Wander Red Sea Coral Reef & Colord Fishes. Book Pharaoh's Island Egypt Boat Trip in Taba to Visit Taba's Only Sightseeing Attraction and Experience Great Snorkeling Time. We will pick you up early in the morning from your hotel in Taba with modern AC van to relish wonderful snorkeling experience at the extreme northern end of Aqaba Gulf. Pharaoh Island or "Gezerit El Fraraun" as it is known in Arabic, is a place of great interest from the cultural and natural point of view. 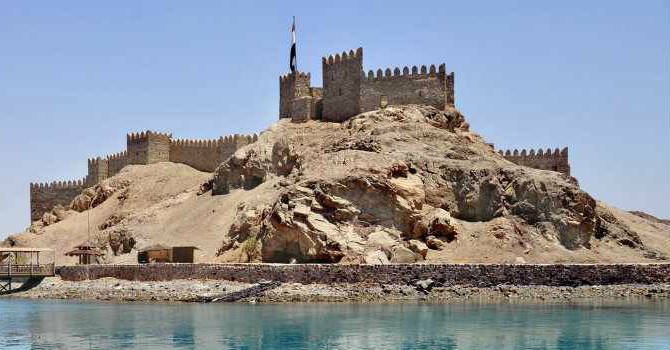 Spend the snorkeling day close to the island then cross to uncover the amazing cove known as Saladin Fortress, established on the island during the Byzantine age; it was taken by the crusades in 1116 and expanded at that time of sultan Saladin. Get your lunch buffet meal aboard cruise close to the island with soft drinks and experienced instructor guide then transfer back to your hotel in Taba. Book Colored Canyon Egypt Tour From Taba. Taba to Colored Canyon Sinai Trip to Visit The Bedouin Village, Red Sea Snorkeling and Hike The Colored Canyon Nuweiba. Private Jeep Safari Trip Into Sinai Desert From Your Hotel in Taba. Book Petra Tour From Taba. Taba to Petra Day Trip to Jordan Great Treasury, Qasr El Bent and Siq Canyon. Taba Petra Excursion By Ferry Boat is Great Activity to Maximize Sightseeing While Holidaying in Taba. Book Mount Moses & St Catherine's Monastery Sunrise Tour From Taba. Mount Sinai Sunrise Tour to Saint Catherine Mountain Egypt and Monastery. Book Mount Sinai Tour From Taba and Experience The Spirituality of Sinai Sacred Biblical Site.